The legal implications of my own challenge to the BRCA gene patents were discussed at length at Genomics Law Report, and by Forbes blogger Robert Langreth. It will be interesting to see how this latest filing by the Justice Department changes the picture. The implications go far beyond the BRCA gene patents: if the initial court ruling and the Justice Department’s position hold up, then virtually all gene patents, on human genes and on many other species’ genes, will become invalid. Some of you may have noticed that I removed my blog post on osteopathic medicine. Over at Forbes there is a fierce debate in the comments section, and I've put up a new post there, at this link, correcting what may have been a too-harsh commentary, if anyone wants to follow this discussion further. California is suffering the worst epidemic of pertussis, or whooping cough, in 60 years, with over 5,200 cases already, the most since 1950. Nine babies have died, all of them too young to receive the vaccine. Michigan is also reporting a serious outbreak, with over 600 cases so far this year. The deaths of the infants in California are tragic, and what’s more tragic is that some of them almost certainly could have been prevented if more people had been vaccinated. 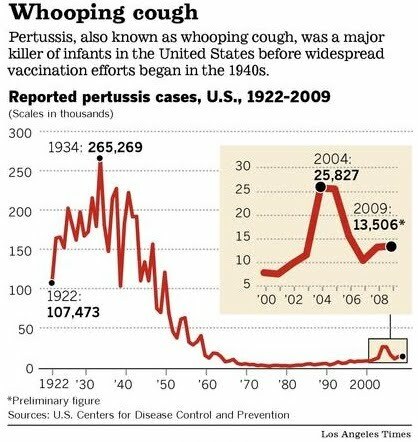 The pertussis vaccine, called DTaP (diphtheria, tetanus, and pertussis) has been responsible for a dramatic drop in whooping cough in recent decades. It isn't 100% effective, but its effectiveness relies in part on “herd immunity”: if enough people are immune to the bacteria, then even if someone gets sick, the disease cannot easily spread through the community. This is especially true for very young infants, who are too young to be vaccinated and whose immune systems are not yet strong enough to defeat the bacteria on their own. Unfortunately, it’s not a coincidence that California is the center of the new pertussis epidemic. Vaccination rates among adults in California have been dropping in recent years, largely due to the influence of anti-vaccination zealots such as Jenny McCarthy and groups such as Age of Autism. Anti-vaccination sentiments seem to strike a chord with relatively well-educated segments of the population – the same people who favor organic food and want to use “natural” products as much as possible. Anti-vaxers appeal to this group by arguing that vaccines are unnatural, and that the body’s own immune system can be “boosted” by various natural treatments. Appealing though this may sound, it has no basis in science. California makes it easy for parents to claim exemptions from the required vaccinations for their children, and exemptions have more than doubled since 1997, according to the L.A. Times. Among the anti-vaccinationists who deserve blame for the current pertussis outbreak is “Dr. Bob” Sears, a kindler, gentler anti-vaxer who claims (like many of them) to be in favor of vaccines, but only under his own, unscientific terms. He stated flatly in the Huffington Post (a hotbed of medical misinformation) recently that pregnant women should not get the DTaP vaccine. But as Dr. Paul Offit tells us in a tragic story, refusing the vaccine can lead directly to the death of an infant. Dr. Bob is just wrong. I should add that Sears has written two books on vaccines and autism, promoting his misguided “alternative” vaccine schedule (see this article in Pediatrics about that) and his rather naive theories about the rise in autism diagnoses. Everyone should have their children vaccinated. On top of that, in order to maintain herd immunity, most of us should get the pertussis booster shot if we haven’t had one in the last ten years. That’s what vaccine expert Paul Offit recommends, and I’m planning to follow his advice myself. It won’t take long, and it might save a life.